I love savory breakfast foods. On Philadelphia’s first snowing morning this winter, I wanted a warm, heating porridge, and found a great option in Whole Grains for a New Generation. 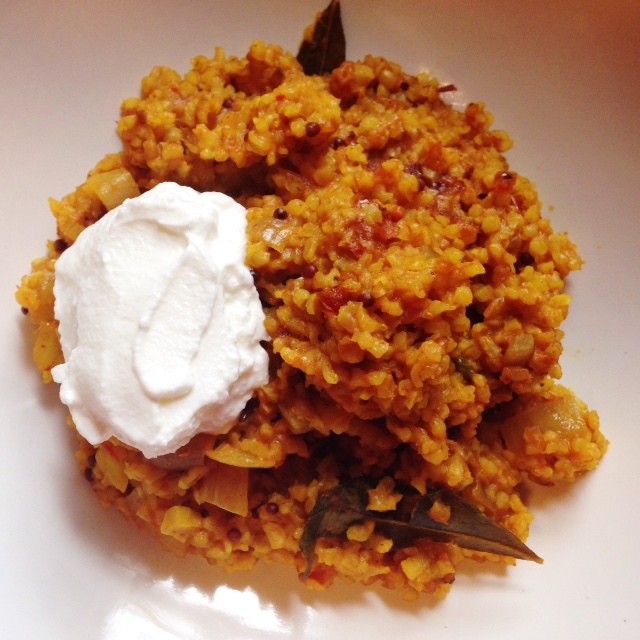 Upma is a spicy Indian mush – but don’t let that dull description fool you! This breakfast porridge had loads of texture, and bold flavors. I had no teff in the pantry, but substituted some bulgar, which is made from the farro grain. I fried the onion, garlic and spices first, then added the grains, an additional half cup of tomato sauce, and some salt, and this rich, spicy porridge was finished in 20 minutes. I topped mine with some greek yogurt, but a soft boiled egg, and scallions would be wonderful, as well, as would the addition of some homemade Indian lemon pickle. As the original recipe suggests, you could also use teff, farina, or any type of cracked whole wheat grain, and I suspect that polenta would also be wonderful. Heat the oil in a nice large saucepan dutch oven. Add the chopped onion and garlic, and saute on medium just until it begins to brown. Toss in the dried spices, stirring, until they release fragrance (about 10 seconds) then add the tomato and chili sauces, stirring well. Add the bulgar, salt, and water, and bring to a boil, then reduce heat and simmer until the bulgar is soft, but still toothsome, and your porridge has reached a thick consistency. Top with yogurt, fresh herbs, soft eggs, or fried shallots.